We're generally aware that we can barely feel an M3 earthquake, an M6 event can cause some damage, and an M9 can wreak havoc on an entire coast. But what do those numbers mean, and why do seismologists talk about several different magnitude scales? Here's a dirty little secret: most seismologists hate to talk about magnitude scales with non-seismologists, for several good and related reasons. First, the whole concept of magnitude reduces a complex and variable process-slip on fault patches with differing strength and frictional properties driven by non-uniformly stressed rocks-to a single number. Second, magnitudes are interpretations derived from quantitative measurements (of ground motion recorded on seismographs), not actual measurements themselves. And third, non-seismologists frequently are impatient with the uncertainties arising from the two reasons just stated. 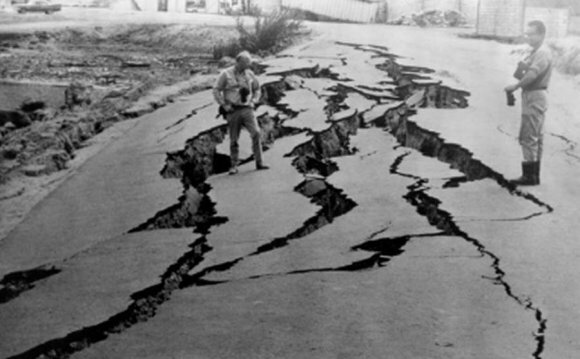 Often folks focus on differences between magnitude estimates for the same earthquake reported by different methods and/or organizations, or magnitude estimates that change in time, as being evidence of some vast conspiracy of government scientists to hide evidence of either ineptitude or deceit (so we seismologists are often a bit defensive). Here we just want to point out a few basic ideas that will help non-seismologists understand some of the technical issues the next time a journalist is making a big deal about, say, an earthquake that PNSN reports as an M3.2 and the NEIC (National Earthquake Information Center in Golden, CO) reports as an M3.5 (or whatever). First of all, of course, we're right! Well, so may be the NEIC. As right as anyone can be, at any rate, and here's why. Oh...and I'm only going to talk about what is called Local Magnitude, a measure based on the largest signal (peak amplitude) measured on seismographs. Other magnitude scales are based on the duration of shaking or matching the seismic waveform wiggle-for-wiggle to a model. Those are for a different blog (and our soon-to-be-published "Discovery & Outreach" wepages) and they are all, ultimately tied to the Local Magnitude, (or ML). Back in the day (1930s), magnitudes started as simply the logarithm of the amplitude of the largest oscillations written on a specific seismograph at CalTech (a Wood-Anderson torsion seismograph measuring horizontal motion, if you must know!). The instrument Charles Richter used was the standard. Really for no other reason than that he had it and so he used it. He used the logarithm of the amplitude because there was such a large range of amplitudes that the compression of scale you get from taking logs made things easier to plot. Some darned earthquake that was 100 km away, made a trace with a peak displacement of 1 mm on his seismograph and he called that the standard earthquake-magnitude 1. An earthquake at the same distance that made a displacement of 10 mm was a magnitude 2, 100 mm was magnitude 3, and so on. "Smaller" earthquakes closer to the lab or "larger" earthquakes more distant might produce the same peak amplitude, so the formula includes a distance correction for earthquakes not at the standard distance. This explains an enduring mystery to many folks-negative magnitudes. An earthquake that wrote a record with a peak displacement of 0.1 mm would be a magnitude 0, right? And if that earthquake were closer than 100 km, well ... it would have a negative magnitude. Remember: Magnitudes are a relative size estimate. Nothing absolute about them (but, perhaps, Charlie Richter's arbitrary "standard" earthquake and seismograph); no physical units ascribed to them. But why do I feel compelled to encase the terms "smaller" and "larger" in quotes so much? Well, because earthquakes, like elephants or people, get bigger in different ways. Both a basketball player and a sumo wrestler are clearly "bigger" than a child or a short lightweight person, but that doesn't make them equally big or similar in appearance. Bigness, it turns out, may be in the eye of the beholder. When physical scientists wander into pickles like this they usually turn to the concept of energy to compare things. And so, too, with earthquakes. There are invariably devils amongst the details. It turns out that earthquakes radiate different amounts of energy as seismic waves in different directions, for example. (One way we tell the orientation of the fault that broke). And even the direction a rupture propagates can lead to different amplitudes in different directions (called "rupture directivity"). For this reason the number and geometry of stations around an earthquake, and how you average them (remember-magnitude is ONE number!) is important in coming out with that one number everyone craves. Also, the soil or rock that a seismometer is placed on can de-amplify seismic motions, or even amplify them, so each site should have a "site correction" in addition. Also, the background noise at the time of the earthquake signal's passing can add to, or subtract from, the peak amplitude measured. Another reason to average in as many station estimates as you can. You get the idea.